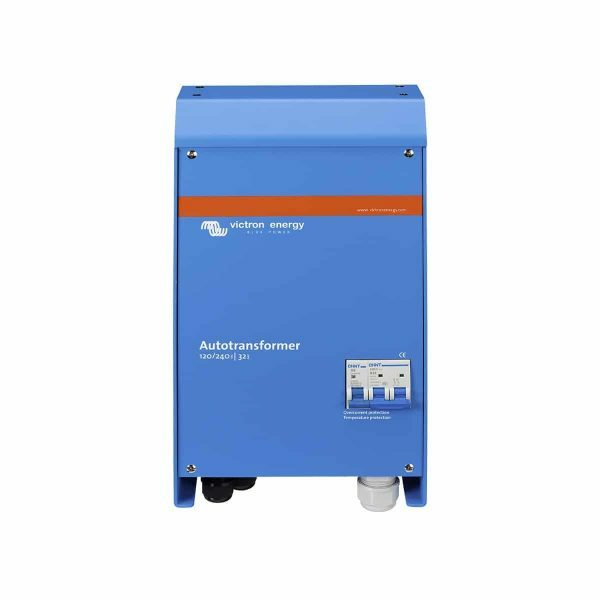 The Victron Autotransformer 120/240VAC-32A Off-Grid Solar is the ideal solution for step up, step down and split phase balancing. An Autotransformer can be used for step up, step down and split phase output balancing purposes. While the step up and step down functions are fairly straightforward, split phase output balancing may require some more attention. difference in current, or current unbalance, will therefore often be 20A or more. This means that the 30A supply will not be used up to its full potential. By the time one leg draws 30A, the other leg may be drawing no more than 10A, and increasing the 240V load, for example, will result in an overload of one leg while the other leg still has spare capacity. Theoretically, the total power that can be drawn from a 30A 120/240V supply is 30 x 240 = 7,2 kVA. In case of 20A unbalance, the practical maximum will be 30 x 120 + 10 x120 = 4,8kVA, or 67% of the theoretical maximum. neutral, as shown in figure 1, any load unbalance is ‘absorbed’ by the Autotransformer. In case of a 30A supply, the load can be increased to 7,2kVA, and a 20A load unbalance will result in one leg supplying 40A, and the other leg 20A. The 20A difference will flow through the neutral and the windings of the Autotransformer. The current through both 120V wires of the split phase supply will be 30A. an additional Autotransformer. Two stacked 120V 3kVA inverters will supply up to 25A to each 120V leg. If the load on one leg is less than 25A, the maximum load on the other leg is still limited to 25A. One 240V 5kVA inverter with a 32A Autotransformer will supply up to 21A of balanced load to each 120V leg. Fewer loads on one leg will however result in more power being available on the other leg, with a maximum unbalance of 32A. autotransformer will therefore be preferable to the stacked inverter solution.